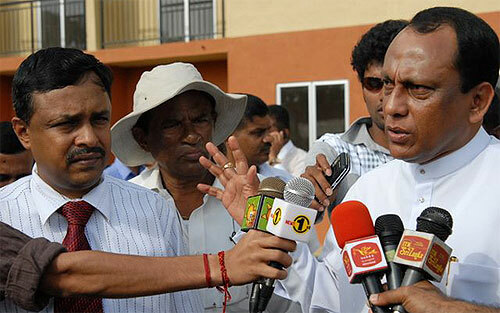 Mass Media Minister Lakshman Yapa Abeywardhana yesterday assured the joint Opposition that it wouldn’t obstruct the Supreme Court being moved against President Mahinda Rajapaksa’s re-election at the presidential polls on January 26. Responding to UNP General Secretary Tissa Attanayake’s accusations that the government had locked-up defeated Opposition presidential candidate, General (retd) Sarath Fonseka to prevent an election petition being filed, the Minister said that the Opposition could obtain his signature, though he remained in the custody of the Sri Lanka Army. He stressed that even a remand prisoner could contest an election and the former Army Chief, held on conspiracy charges, was free to sign the proposed election petition. He said that the government wouldn’t in anyway obstruct the Opposition move. Election Chief Dayananda Dissanayake recently challenged the Opposition to move the Supreme Court following allegations that Rajapaksa won a second term through a computer fraud. Minister Abeywardhana said that had the government moved against the former Chief of Defence Staff (CDS) in the run-up to the January 26 polls, the UPFA would have been accused of interfering with their propaganda campaign. The Opposition would have capitalised on the move, he said, dismissing allegations the President secured a second term through fraudulent means. He urged the Opposition not to politicise purely a security issue. The Military Police on Monday night arrested Fonseka at his main office at Rajakeeya Mawatha, where he was having consultations with leading Opposition figures. Rejecting allegations that troops had manhandled Fonseka or assaulted him, Minister Abeywardhana said that he was being investigated mainly on four major charges. According to him, Fonseka had engaged in politics while being a serving officer, conspired against the President, employing deserters and fraudulent transactions relating to procurement. Referring to a recent interview the BBC had with Fonseka, the Minister said that the former Army Chief could not act in a way detrimental to national security. An irate Minister said that Fonseka had been a member of the team which spearheaded the war.